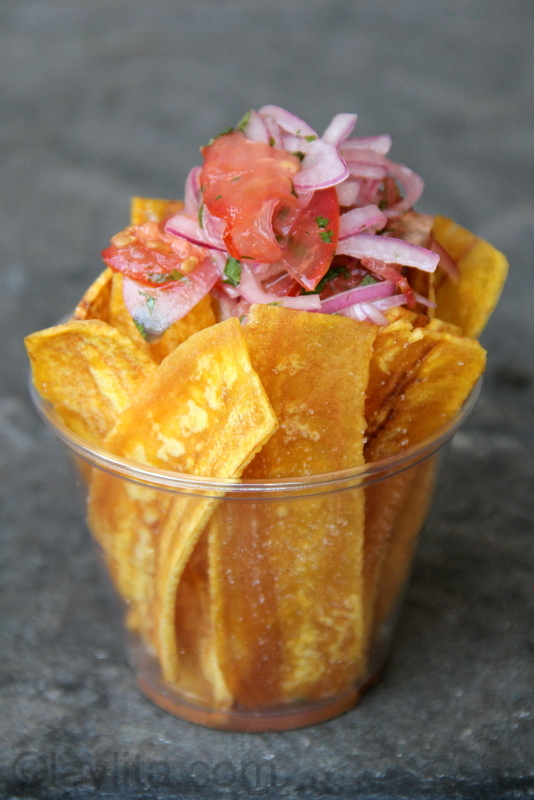 Chifles are thinly sliced fried green plantain chips. 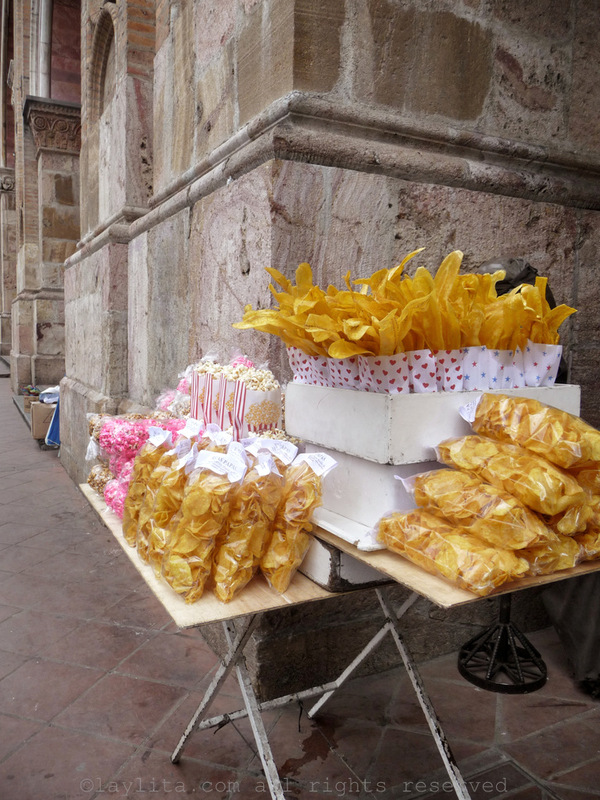 While we call them chifles in Ecuador, these yummy plantain chips are also known as mariquitas, chicharitas, platanutres or platanainas, depending on the Latin American country or region. These days it is now very easy to find the chifle style plantain chips in stores in the US (and even Europe – last summer I found them at Carrefour in France). But like many food dishes, the homemade version is so much better. 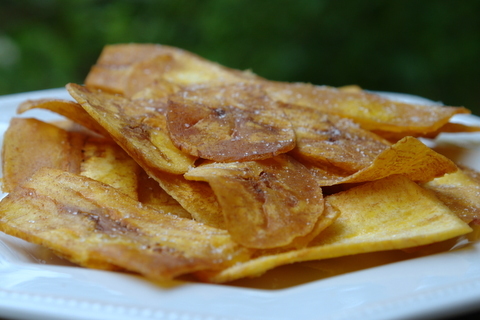 Homemade recipe for chifles, also known as mariquitas, chicharitas, platanutres, platanitos or plataninas, or thin fried green plantain banana chips. 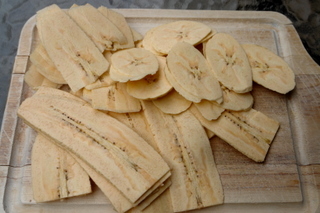 Peel the green bananas or green plantains; be careful as both tend to stain clothes and cutting boards. 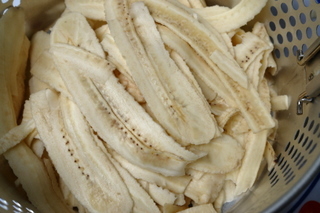 The plantains will be easier to peel, but the flesh of the green banana is more likely to stick to its skin. Slice the bananas or plantains lengthwise, full length or half length, or slice them as thin rounds or thin diagonal ovals, use a mandolin to get that perfect thinness. Heat the oil, either in a deep sauté pan or fryer, ideal temperature for frying these is between 375 F -400 F, there should be enough oil to fully cover the bananas or plantains. Add the bananas or plantains to the hot oil; be careful not to overcrowd to keep them from sticking together. Fry until the chips get a golden color. 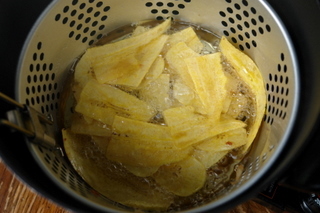 Remove the chips from the oil and drain on paper towels. Sprinkle with salt and serve either warm or cold. Chifles are a great garnish for ceviches. These chips can also be served as an appetizer or snack with sauces, try the tomato and onion curtido or aji criollo hot sauce, and cold beer. There is even a brand of packaged chifles in Ecuador called chifles cerveceros (with a yummy spicy version). There is something about the weather getting warmer that makes me crave traditional South American street food, it must be just being able to spend more time outside. It is very typical to have people selling these plantain chips in small bags right outside of schools and different events. 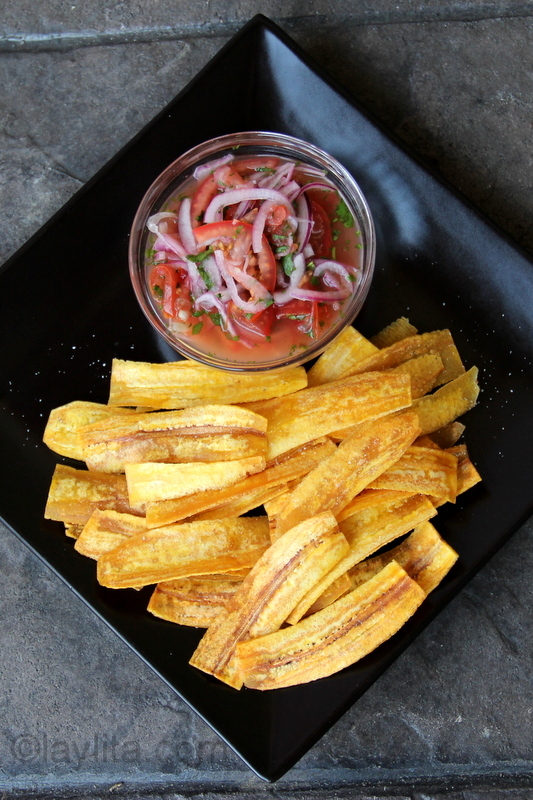 They are usually drizzled with a salsa rosada – very similar to one for salchipapas. 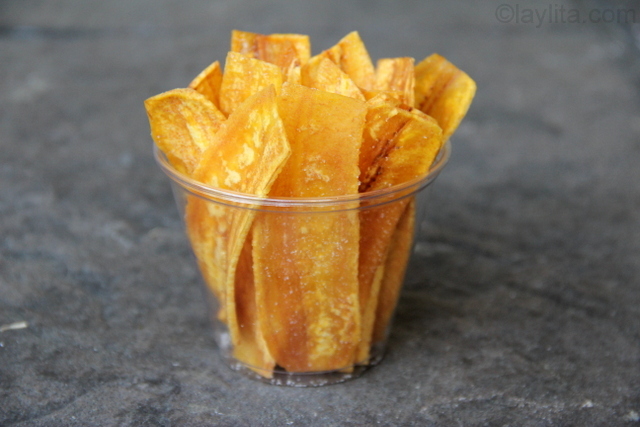 In Ecuador these fried chips are sometimes made with green bananas, especially at home when you might have some green bananas around (or growing on a plant in the yard). Most chifles that are sold by street vendors, restaurants or in stores are usually made with green plantains – they are more solid and easier to slice than green bananas. The homemade factor of the green banana chilfes are one of the reasons I probably associate that style of chips with a comfort food. Either way chifles are delicious when made fresh. 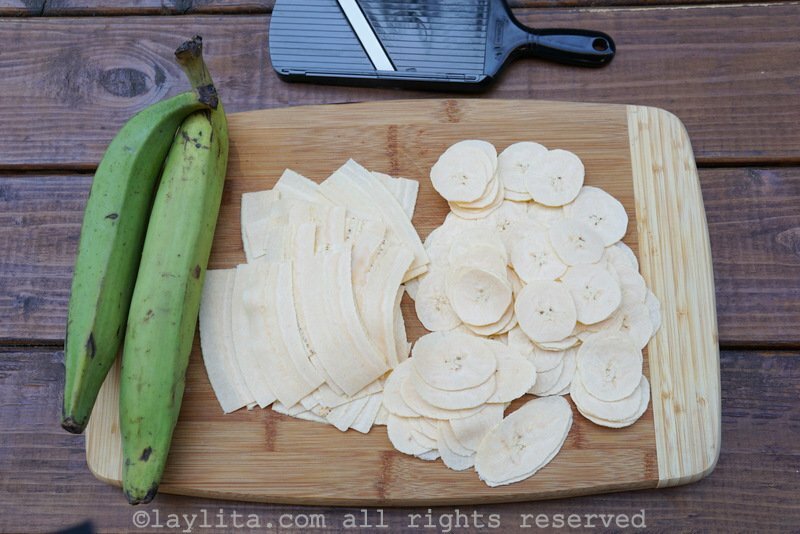 It is probably easier for most of us who live outside of Latin America to make these with green plantains since green bananas can be hard to find. I am able to find them occasionally and when I do I grab as many as I can get and make chifles, as well as a soup called arvejas con guineo and another soup called repe. It’s funny but I consider ripe bananas to be fruit and green bananas as vegetables. There is a subtle taste difference the two types of chifles, the banana ones have a much more smooth and delicate flavor, while the plantains ones have a stronger chippy flavor, also the color is different, both raw and cooked, the plantains are darker and the green bananas have a more pale color. Another difference is the consistency, the green bananas are very sticky and not as easy to handle, so overall chifles or chips made with green plantains are easier to find and make, but if you do ever find some very green bananas try it and you will taste the difference. If you become a chifle fan and want to try different variations, you can add hot peppers or garlic to the oil to infuse that flavor into the chips. Esta receta fue muy bien. Fue muy rápido y muy delicioso. Me encanta la textura crujiente de los plátanos. Es como las patatas fritas, pero más saludable. 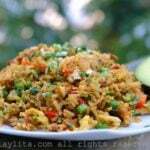 Actually you can use either green plantains (platano macho) or regular (but very green) bananas to make chifles. 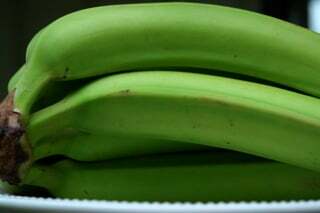 Of course, in the US even the bananas that look green are usually not green enough, so it’s best to make them with plantains. Also, it is easier to slice the green plantains than the green bananas. Currently subsisting off these while traveling in Ecuador! They have become my favorite – can’t wait to try and make these! I work on a banana farm and bunchs that arents big enough we just chop down for mulch, Im about to start snagging them and making chips on the side of the road with coconut oil hawaiin clay salt and tumeric. it’s always a joy to read your posts and enjoy the recipes. I am writing a post about bananas and will point them here for the chifle recipe. I suspect you have one about patacones as well! I’ll continue my search! Are the green bananas and green plantains just unripened or not quite ready for raw consumption fruits? Also, do they get too crunchy to do thicker chips? I would love to make these as scoopers for a cilantro-corn salsa that I just made! Optional to green banana, i use raw green mangoes deep fried in coconut oil. After the fry, take a bowl and add pinch of red chilly powder, black pepperica and serve it with cream dip or tomato ketchup. Enjoy ! wow, this is a great site. I love your recipes and your pictures! I’m just learning to cook latin american delicacies. for the past two weeks, ive had lots of rice, beans and platanos in different styles. thanks for the new ones. 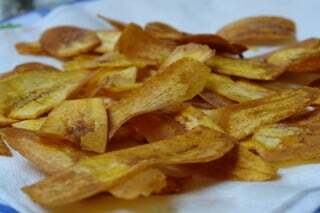 We have so enjoyed making and eating your banana chips. 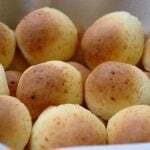 We make them with Macadamia oil and they are just as successful. Now though we are trying to make Honey coated ones, and unfortunately are not succeeding at all. they either are soft or burn. So if anyone could help us in the making of these or give us any suggestions we would appreciate it very much indeed. 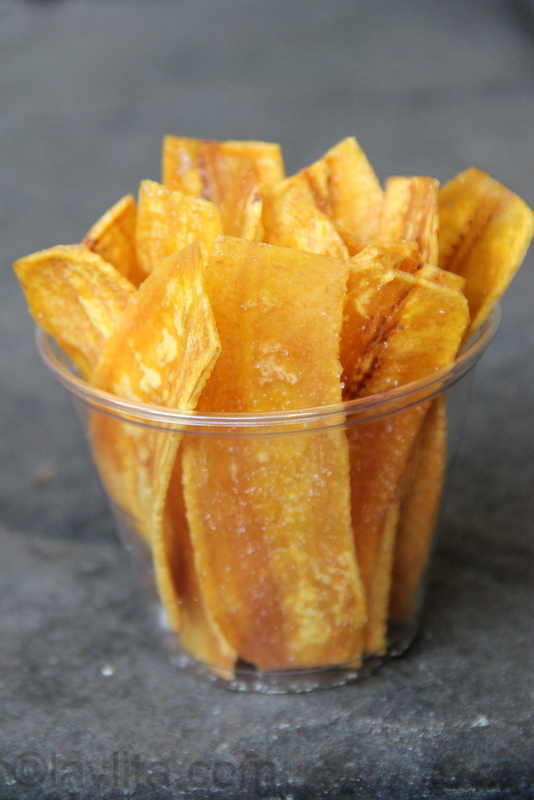 Hi Paz – Plantains are great, so many different things to make with them. 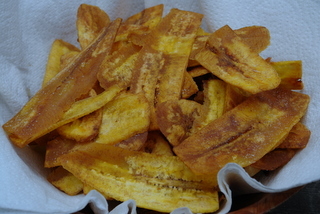 Hi Mimee – I bought a bag of the sweet plantain chips a while ago (thinking they were the green ones) and I didn’t like them, but I’ll have to try making them, I’m sure they’re a lot better homemade. 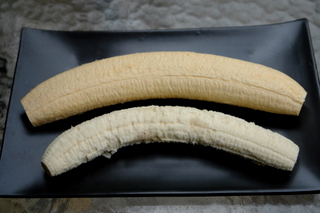 I use a similar method for peeling the green bananas, I try to make the lengthwise cut on one of the angles, skin deep only without touching the actual flesh of the fruit, and also use the knife to raise the skin (almost the same method for peeling a yuca or cassava root). Though the greener the bananas the harder it is to do this, the flesh tends to stick to the skin if they’re very green, in that case I peel them just like you would peel a potato, I do this under running water to keep them from staining everything and from darkening. Green plantains are a lot easier to peel. I like eating chifles once in a while. They make an excellent snack. I believe the same thing can be done to yellow plantains, producing sweeter chips. I like those too. How do you usually peel the bananas? I LOVE plantains! This recipe looks so good! Hi, I see you can use either green bananas or green plantains. Is there a difference? They look wonderful, wish I could find plantains here.